The second or third iteration of our company’s website had an option for a white background or a black background. I leaned toward the white background while my husband liked the darker background. I emailed the test design to a couple of clients along with friends and family members to test what color received the best response. (I’m acutely aware that I’m not always my own target market.) I do not remember exactly how many people responded for each color but I do remember men leaned toward the darker background while women preferred the white background. The ease of testing digital ads is one of the reasons we love this format so much. We hear medical clinics and home improvement retailers complain about their lack of response to digital ads and ask a lot of questions about the ads themselves. Testing search and display ads allow us to pinpoint what’s really working, what can work better and what’s not working at all. If you haven’t tested your digital ads, Facebook and Google Ads have made the process easier than ever. Here’s how. In the past, we’ve created our own A/B testing for Facebook ads until the platform implemented it’s own A/B testing. Their test allows you to choose one element of four for your test and allows you to run the test for up to 30 days. The platform chooses a winner based on which ad delivers the most results at the lowest cost. Digging deeper into the analytics we find some other great information on relevance, click-through rates and engagement even if those aren’t our primary objectives. Pictures and video make or break display ads all the time. For one of our clients, we tested a lifestyle image against a product placement image and found our audience responded better to the product placement image. This information affects every decision we make about the images we use not only in our ads but also in our organic posts. I’m hearing a lot of buzz about Instagram ads. We love the idea of finding out whether our target market is primary on Facebook or Insta. In addition, Facebook offer messenger and audience network placement. Unsure about whether you want to show an ad on audience placement? Pit it against a Facebook newsfeed placement and see which one wins. We’ve studied the psychology behind how different audience groups respond to different images, keywords, tone and language. Feel like your ads are reaching one of your target audiences more than another? Test the same ad against two different audiences. One of our clients wanted to increase weekend traffic so we run ads more heavily during those times of the week. If you’re unsure which time garners the best results, target when and how often your audience receives your ads. Facebook may host the largest audience of any social media platform and own the next fastest growing platform (Instagram), but Google still owns search (much to Facebook’s dismay). People do search Facebook for phone numbers and other information but Google continues to be the go-to for search queries. Strong SEO pushes your content to the front but businesses struggle to maintain their position when larger companies invest more into development. Paid search ads allow businesses to target who exactly they want to see their ads and what they see. Several variables go into the price you pay for an ad including competition for those keywords and the relevance of your ad. 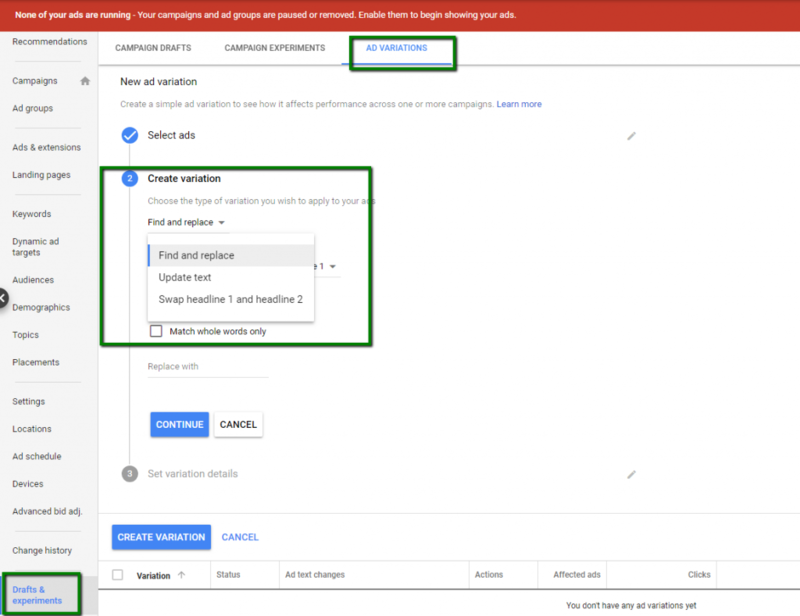 Google now allows companies to pit their strong ads against variations to find out which call to action drives the most conversions or whether specific headlines make a difference. Once you’ve decided what you’d like to test, make sure to choose what percent of your budget you’d like to dedicate to the new ad. To give these ads their best chance possible set your budget to spend 50% on the new ads. Your Google Ads perform well, but you’re curious if you changed the call to action from “Get” to “Buy” if it would make a difference. Or what if you changed out a product’s brand name for the generic name instead. Find & Replace allows you to change specific words in your ads and compare the return. Have an idea for a completely new ad but the old one still returns fantastic results? Change out the text in your ad and compare the two. Maybe your new idea is fresh and fun enough to outwork the tried and true. Now you can find out without disabling or killing your current ads. Does the order of your benefits or features really make any difference? You may have wondered it to yourself but not out loud. It’s a small tweak that might not make a difference, or it could catch readers’ eyes in a way the original ad never did. 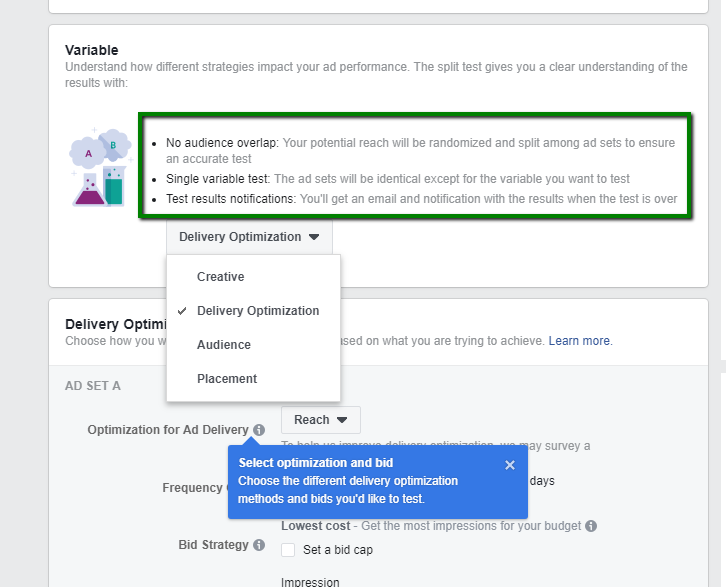 In either Facebook, Instagram or Google Ads you can make your new ads permanent or leave them alone once the test finishes. We implore you not to delete either your current ads or your test ads even if you no longer intend to use them. The data they provide is invaluable as you continue to tweak your ads. Always create new ads with which to run your tests. No time to set up Facebook or Google ads much less test which ones perform the best for your business? We’re here to help. We’ll launch your ads, test new content and promote what works best while you manage your staff and your customers. Call us at 662-869-8665 to get started.